Read Part II exploring the original Thanos comics. Written by Jason Aaron and illustrated by Simone Bianchi, the first issue of 2013’s Thanos Rising origin story starts with three pages of the adult Thanos returning to Titan before slipping into a flashback that takes us all the way back to the day he was born. Already we’re on shaky ground here, as I’m not sure I like the idea of Thanos ever having been a child. I prefer the idea that a godlike character such as he emerges into the world as a near adult, much like the goddess Athena sprang fully grown from her father Zeus’s skull in ancient myth. But this likely would have been a minor complaint if Aaron could have followed up and written a childhood for Thanos that was suitably strange, alien, and thought-provoking. Unfortunately, he does not. In fact, he doesn’t even appear to try. How the classic character should be handled… and how he shouldn’t be. Ambiguity can be the most powerful tool in an artist’s toolbox. Remember the series finale of The Sopranos? That abrupt cut to black? Seven years later people still argue about it. One blogger wrote a 30,000-word treatise on it (http://masterofsopranos.wordpress.com/the-sopranos-definitive-explanation-of-the-end/). What the hell did it mean, anyway? Did Tony Soprano die? Or could there be some larger symbolism behind it? One thing is certain: writer/director/producer David Chase is not about to spell out his intentions for us. Which is probably smart because, really, there’d be nothing left to debate if he did. The uncertainty is what keeps everyone talking—lending the ending more depth in the process; making it feel much scarier and far more compelling. This is the power of ambiguity. A little mystery can go a long, long way. Which brings me to the topic of this week’s column. 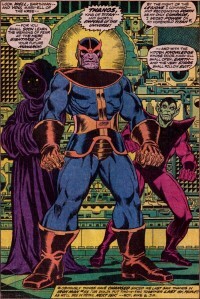 Marvel recently released the first issue of a five-issue miniseries called Thanos Rising. Its purpose is to fill in the backstory of one of the greatest antagonists in the history of the Marvel Universe, Thanos. The following is an original article on the graphic novel Marvels. The article was writtne by Pronto Comics own, Jorel Lonesome. The Graphic Novel titled Marvels written by Kurt Busiek and illustrated by Alex Ross, is an entertaining literary work everyone could relate to. As a four-issue comic book series released in the early 1990s, the book leaves us with a question “How would the world react if superheroes existed?” and answers through imaginatively predicting based on human instincts. From vivid visuals and convincing storytelling from page to page, I was hooked, wondering what would happen next in each chapter. Marvels, introduces you to the main character protagonist Phil Sheldon, a hardworking news photographer and family man driven to find success in his profession. Sheldon serves as narrator throughout the story. During his life, focusing on his career as a news photographer in the early 1940s, the world suddenly becomes a place full of super powered costumed avengers later known as “Marvels”. The strength of this work is the theme of ordinary people with ordinary lives experiencing the beginning of hero and villain phenomena and the impact it has on humanity. As the story progresses, we see how the public was amazed, yet intimidated by something surpassing the level of human ability in various ways, which struck fear in many, causing people to be hostile and unfair to any living thing foreign to us. One of the things we can relate to in this story is the character’s fear. Phil and a crowd of people get involved in a scuffle against mutants called the X-Men, which are considered as the next stage of human evolution. They didn’t seem welcome by people nor were some mutants a friendly bunch, which led to bitter conflicts. Typical humans feared the powers they had because their attitudes and motifs were untrusted, thus they could use their special abilities negatively in society instead of using them for the greater good. The public was tired of being scared, seeking for mutants to kill as they start an outbreak of violence through anger without thinking about the safety of others. It is an example of how human beings are the most dominant species on the planet, but being introduced to organisms with powers above their grade, which they cannot acquire, makes them feel they are no longer paramount. They are curiously skeptical about their future as people. The message is that, in reality, people could see all this as a threat to their existence, solving the issues using physical force instead of a humane approach due to fear. 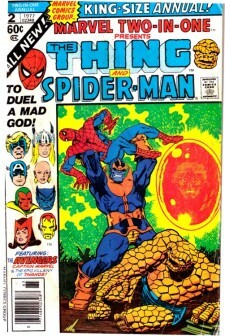 In this story, jealousy is exhibited, case in point, there is a scene where New York City is attacked by a planet eating entity named Galactus. The city goes into a panic, believing the adversity will lead to Armageddon until, a crew of superheroes called the Fantastic Four save the day, defeating Galactus and his minions. After the Fantastic Four’s triumph, people surprisingly turn their backs on the heroes claiming that event was a hoax to make superheroes look good in the public eye, though Galactus was really a threat to mankind. Along with that issue a masked superhero known as Spiderman is blamed for the death of a NYPD captain, which was heavily addressed by the media. Spider-man was actually innocent. This was a sign of envious dislike and insecurity on the part of humans because they felt no one could be so heroically altruistic on such a grandiose scale as the Marvels did. A way we can relate to this matter is that in the real world, some of us are jealous or insecure of each other for many reasons. It could be because someone does the job better than another, has something you can’t have or takes work to obtain, or just not having the same qualities like him or her that you desire for yourself. The advancement of science is another subject where the readers and writer could have a connection to reality as well as fiction. In the Marvels story, taking place in the 1930s, a scientist named Phineas Horton creates an android using steel, synthetics along with understanding of the human mind. The experiment goes wrong .The android has an incendiary reaction with air causing its body to turn full blaze. It would go back to its original state with no exposure to oxygen. Phineas decided to demonstrate his experiment in the eyes of the audience. When people saw what he had invented, everyone was terrified and unprepared for something that seemed too odd, unwanted and demanded Phineas get rid of his creation. In our natural world, we have experimented on many things from medical experiments to stem cell research. Like Phineas, scientists today perform experiments, some that the world is not ready for. A lot of people resent these creations, which they feel is a problem to their religion, morality or philosophical views. In a fictional story, you can interpret its themes using everyday life. Fear, jealousy and advanced science are what we all experience together in socializing, personal matter and media. Life on earth and life in Marvels both share these three things. Have you ever felt jealousy? Fear? Or have known about a controversial scientific experiment that made you question its ethics? Well knowing how we are as human beings, this is a work of literature we can relate to.